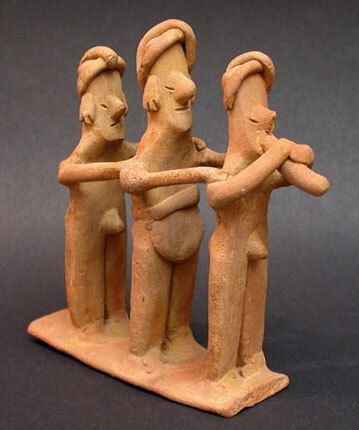 This conjoined dance group depicts three male figures standing single file on a flat rectangular base, facing forward, each with incised slit eyes, wearing crisscrossed turbans and ear ornaments. The first figure is playing a flute held with both hands, the second, wearing an apron and belt, has both hands on the shoulder of the first. The third, in turn has both of his hands on the shoulder of the second. There are remains of native red pigment in areas of detail within the group. This 'anecdotal' object dates to the Late Preclassic to the Protoclassic Period of West Mexican Colima sculpture, circa 300 B.C. to A.D. 250. Aside from a 'clean break' repair on the base, and a simple arm fracture rejoin, this figural group is in exceptionally good condition. Cf. von Winning & Hammer, Anecdotal Sculpture of Ancient West Mexico, Pp. 81-82, Figs. 131, 134, 135, & 136, Los Angeles, 1972. Provenance: This Colima dance group was part of a Southern California private collection since the 1960s.